Philadelphia has over 100 years of experience in MLB. So, when the worst road team in the history of MLB comes to town and hits about one third of the fastballs they should hit on the first day of the series, the Phillies decide to give them some slack and throw the two seam to them in the second game. 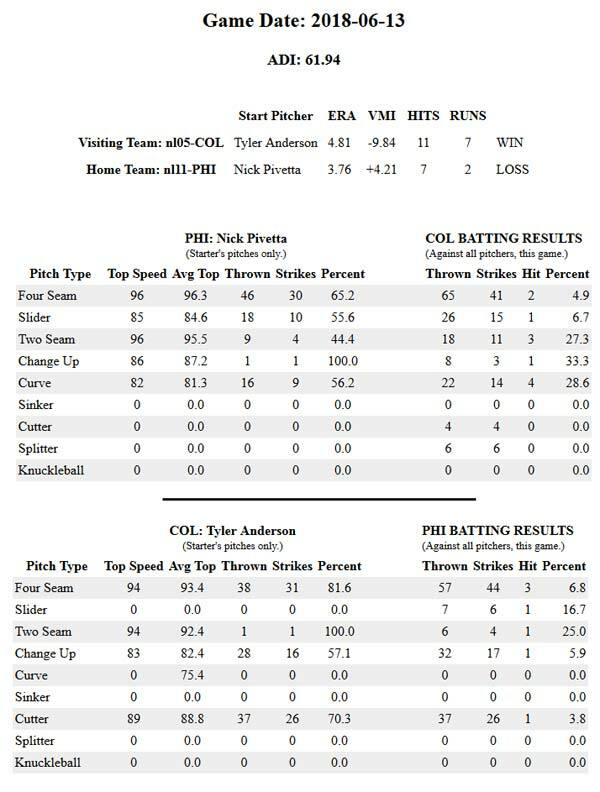 Never mind that the Rockies hit the two-seamer quite well in the first game. After all—every hitter is completely different, isn’t he? In Game One of this series, Colorado hitters combined for one hit off 31 Four-Seam strikes thrown for a miserable 3.2% hit ratio. As most of you know, the average in MLB is approximately a 10% ratio on most pitches. However, the Rockies, sporting a delirious VMI of -24.66 meaning they are setting up 3 inches below the track of the 4-seamer hit the 2-seamer at a rate of 13% because of the lower tracking 2-seamer. But, Philadelphia pitchers, catchers and coaches must have decided they should throw 40 two-seamers and curves to Colorado hitters on the second game of this series, because you know, lightning never strikes twice in the same place. Well, the Rockies more than doubled their effectiveness on both those lower tracking pitches, but hit only half the 4-seamers the average MLB team hits. What good does 100 years of experience do for a team?